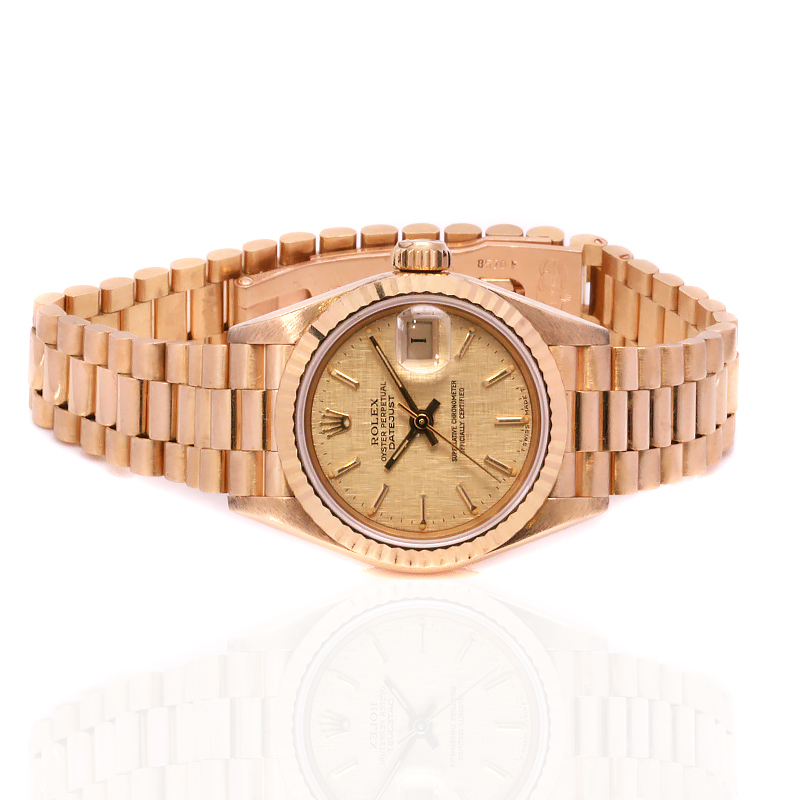 Product code: W1384 Categories: Sold Items, Sold Rolex Watches. Here is a beautifully presented ladies 18ct Rolex Linen dial President with box and papers reference 69178. The distinguishing feature about this ladies Rolex President over many others, is that it has the hard to find Rolex linen dial. The linen dial has as the name implies, a finish somewhat akin to linen. With soft vertical and horizontal lines on the champagne coloured dial, this gives it a very subtle yet elegant finish that is highlighted with the index markers and date window. 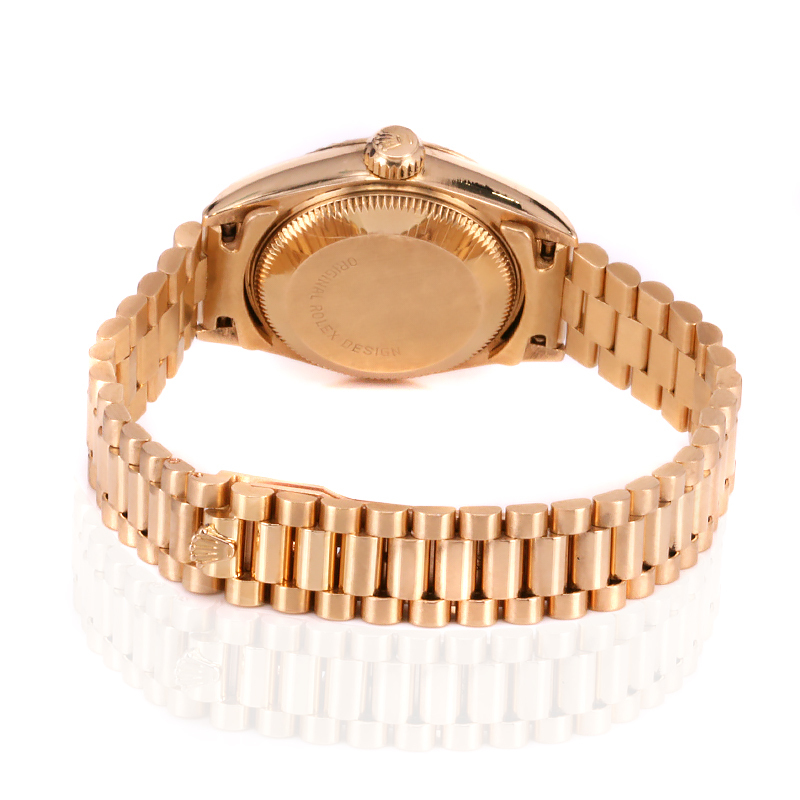 Made in solid 18ct yellow gold from the case to the Rolex President band, the case measures 26mm across plus the Rolex screw down crown. Inside it is powered by the highly reliable and accurate 29 jewelled automatic Rolex calibre 2135 that has just come back from a full service and is complete with our twelve month warranty. Complete with box and papers, this ladies Rolex President looks and feels perfect on the wrist. Tags: Ladies 18ct Rolex President, Rolex 69178. Ladies 18ct Rolex Linen dial President with box and papers reference 69178. The Rolex Linen dial is one of the more sought after dial variations found on vintage Rolex watches. With an elegant and discreet finish, the lines run both horizontal and vertical across the dial. Made for the Asian market in the 1970’s to 1980’s, it should not be confused with the Shantung dial which only has horizontal lines.